The New York Fed says it had reports about Barclays and its Libor submissions in 2008. WASHINGTON (CNNMoney) -- Four years ago, the Federal Reserve of New York asked Barclays about how it submitted its suggested Libor rates -- and that has spurred Congress to question what U.S. regulators knew about manipulation of a key financial indicator during the financial crisis. 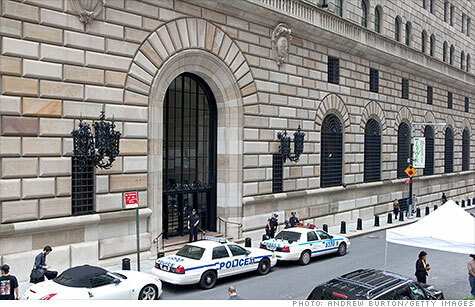 Lawmakers want to learn more after a New York Fed statement released Monday. The bank said it had received "occasional anecdotal reports from Barclays of problems with Libor." The New York Fed said that, after the 2008 failure of the Wall Street bank Bear Stearns and before the first media reports on the subject, it asked Barclays how its Libor submissions were being conducted. "We subsequently shared analysis and suggestions for reform of Libor with the relevant authorities in the U.K.," the statement said. The statement came after Rep. Randy Neugebauer, the Texas Republican who runs the House Financial Services Subcommittee on Oversight and Investigations, sent a letter to the New York Fed asking for transcripts between Fed officials and Barclays dating from August 2007 through November 2009. Neugebauer said in the letter that he was concerned about "12 contacts between Barclays and the Federal Reserve of New York related to its Libor submissions." The Senate Banking Committee said that, at an already scheduled hearing next Tuesday, senators could ask Federal Reserve Chairman Ben Bernanke about the scandal involving Libor rates. The panel also said lawmakers could question Treasury Secretary Tim Geithner at a hearing later this month. "It is important that we understand how any manipulation may impact American consumers and the U.S. financial system," said the head of the panel, Sen. Tim Johnson, a South Dakota Democrat. The panel will also hold "bipartisan briefings with relevant parties." The New York Fed is responding to all Congressional requests for information, a spokeswoman said. Requests for comment placed to Treasury were not immediately returned. Geithner was president of the New York Fed in 2008. Geithner declined to answer questions Tuesday while heading into a Senate Democratic Caucus meeting at the Capitol. Barclays Capital (BCS) shocked the financial world last month when it paid $453 million in a settlement with U.S. and U.K. regulators, admitting that it lied in its Libor submissions about its cost of borrowing. CEO Bob Diamond, among top officers, has resigned, and the scandal is threatening to spread to other banks and regulators. Between 2005 and 2008, Barclays traders repeatedly requested that colleagues in charge of the Libor process tailor the bank's submissions to benefit their trading positions. Barclays staffers also colluded with counterparts from other banks to manipulate rates, according to the settlement. U.S. lawmakers care because Libor is used to set interest rates for credit cards and mortgages in the United States. In addition, some U.S. banks, including JPMorgan Chase (JPM, Fortune 500) andCitigroup (C, Fortune 500), are reportedly under investigation. Over the weekend, Rep. Barney Frank, a Massachusetts Democrat and co-namesake of the Dodd-Frank Act aimed at reforming Wall Street, called the scandal "outrageous" in an interview with the Financial Times. A spokesman for Frank confirmed Monday that he hoped Congress would hold hearings. Over the past week, news of the scandal over Libor was closely watched in Washington, where current and former policymakers often consulted the Libor rate during the financial crisis as one of many indicators that helped them size up the health of the banking system. "We used Libor as an indicator of stresses facing banks," said Phillip Swagel, a former assistant secretary of the Treasury in 2008 who teaches at University of Maryland. "It's disturbing to know that the indicator was manipulated. We never would have imagined that it would be manipulated." If Libor goes up, monthly interest rate payments may go up with it. If it goes down, some borrowers will enjoy lower interest rates, but mutual funds and pensions with investments in Libor-based securities will earn less in interest. -- CNN's Ted Barrett contributed to this report.